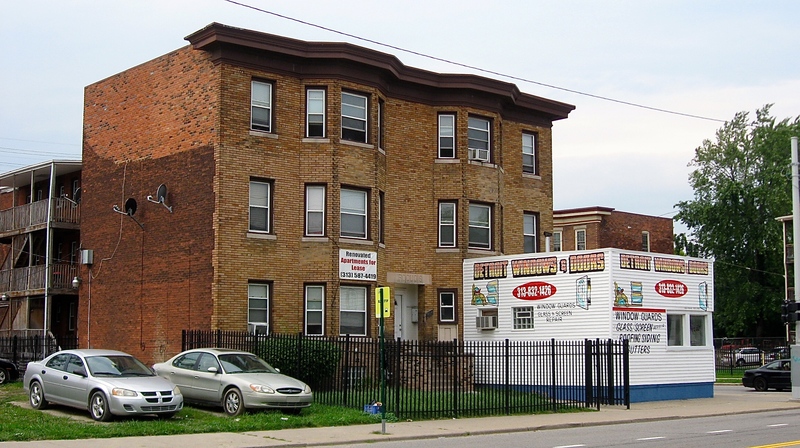 There are some unique, interesting old apartments and single-family buildings in Detroit built in a variety of styles. Many are still occupied and well maintained. A few have unusual little additions on the front of them that contain businesses, restaurants or walkways leading to adjoining residential buildings. I don’t know how the concept of adding to the front of buildings evolved, but they are odd-looking. Most of the quirky little additions are constructed of brick. A few are made of wood, and all the ones I’ve seen are attached to places that look to be 75 to 100 years old. Some tap into half of the front of the building, while others look to be attached just enough to allow for a standard doorway between the add-on structure and the home or apartment building. Some of the peculiar additions are painted in bright, eye squinting colors that glow in the sunlight. However they evolved and whatever the reason for attaching them to the front of residential buildings might be, they sure are odd additions to the once beautiful, old residential homes. So odd in fact, that they destroy the architectural character of the buildings that are hooked to. While looking at these places on my bicycle rides, I think the little square editions are some type of offshoot of the late 1800’s, early 1900’s version of a live/work environment. It wasn’t unusual back then for a store to be built at ground level with an apartment above. I see the attached additions scattered about the city, mostly along busy streets on the fringe of good, solid neighborhoods. I wonder what it must be like for the people living in the apartment buildings or homes where these unusual additions are found. Detroit is one of the oldest cities in America. It’s been around for over 300 years and survived major fires, riots, downturns in the economy, etc. In its prime, the city’s neighborhoods were packed solid with houses; some build so close there was only a walkway between them. 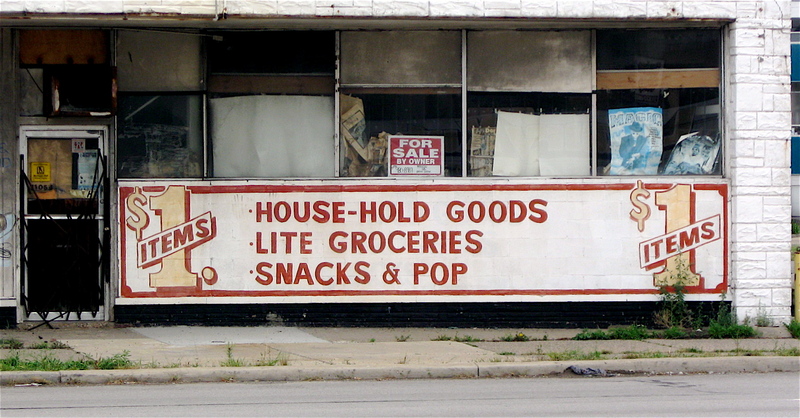 Most of the densely populated neighborhoods had a corner store that people could easily walk to for general household items. I stumbled upon such a store the other day in a nearby Westside community. This vintage brick beauty I saw probably went up in the late 1800s or very early 1900s. At that time, bricks were easy to manufacture, cheap, and commonly used for construction during this period of rapid growth in Detroit. The charming old place was undoubtedly built as a bakery, candy store or a common general store that served the residents of the community long before the automobile made it easier to shop downtown and elsewhere. One of the many things I like about old buildings is the brickwork and unique architectural details. This place has both. The simple, yet somewhat ornate brickwork above the second story windows, along the roofline and outer edges of the building create an interesting arch. The upper windows on the two-story section and on the single story part of the building are arched as well, a classic feature of the era. In its prime, the building’s two large windows that bookend the main entry door were more than likely used for display purposes. It’s good to see this old, well-constructed brick beauty is still standing, in use, and overall it looks to be in pretty good shape. 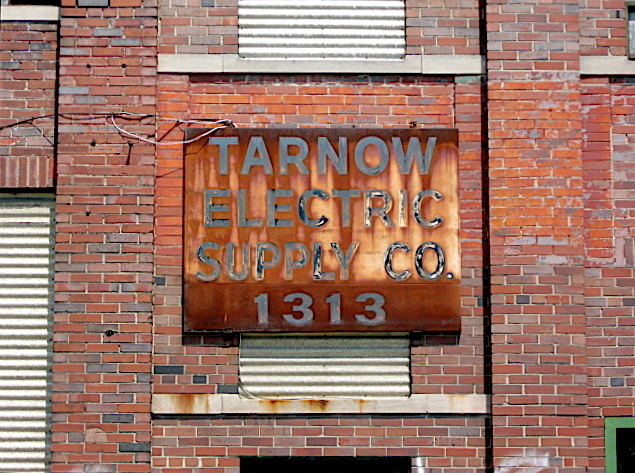 As I’ve written in past blog entries on Detroit’s fading wall signs, many of the city’s old brick structures and other weathered buildings have some incredibly designed wall signs. Many that I’ve spotted while on my bicycle rides look as if they were hand-painted on the sides of buildings sometime in the 1920’s or 30’s. A few look a bit older, and I wouldn’t be surprised if they were painted on the brick walls sometime in the late 1800’s or early 1900’s. It’s remarkable that they have survived decades and are generally readable despite our somewhat harsh climate. Some of the most interesting wall signs feature fascinating, pastel colored illustrations and decorative letter fonts that one would find in a 100-year-old book or in an old yellowed magazine found in an antique store. Others I’ve seen are simple in design, with nothing more than block letters that advertise a manufacturing company, a specific service, or basic household goods. 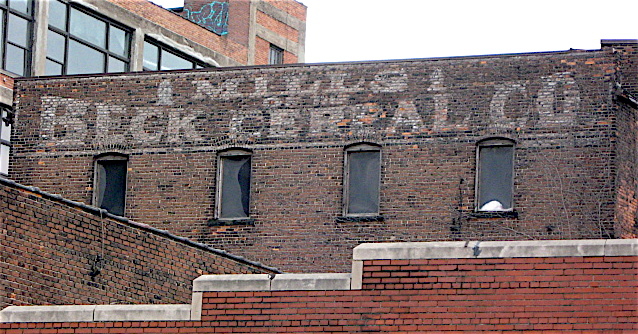 Detroit has plenty of older brick buildings that feature the vintage signs. In many cases, they have been hidden for years on the sides of the older buildings because other structures have been constructed next to them, blocking their view. 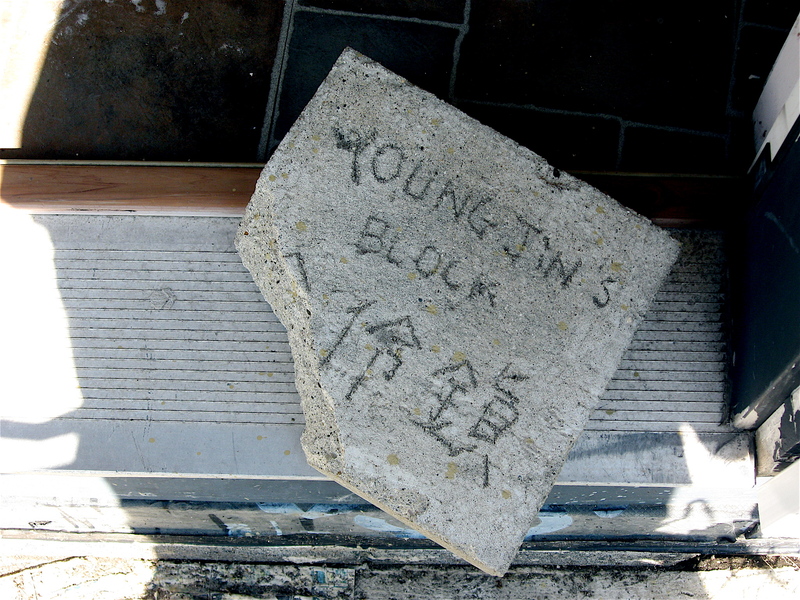 Once the neighboring buildings were torn down, the classic old signs have been exposed. 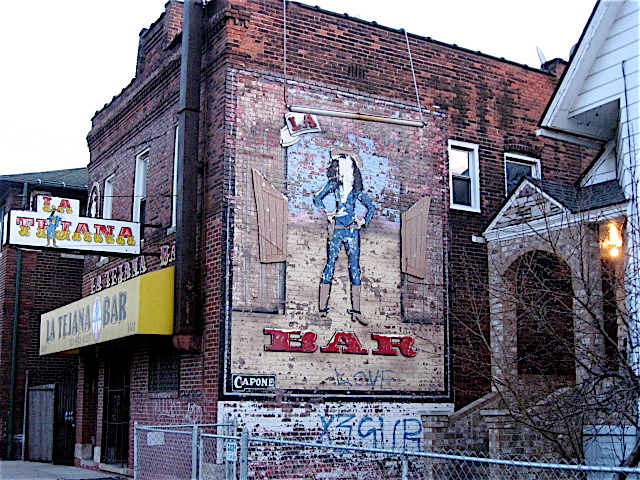 As time moves on and the city evolves, many of the old buildings where the signs can be found will be torn down. 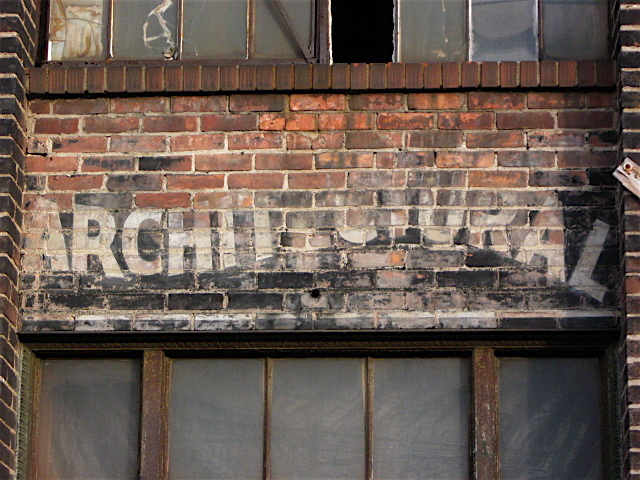 The fading signs on the sides of buildings that survive the wrecking ball will eventually deteriorate due to the weather and other factors. Unfortunately, they too will slowly fade into the brick they were painted on and be lost forever. 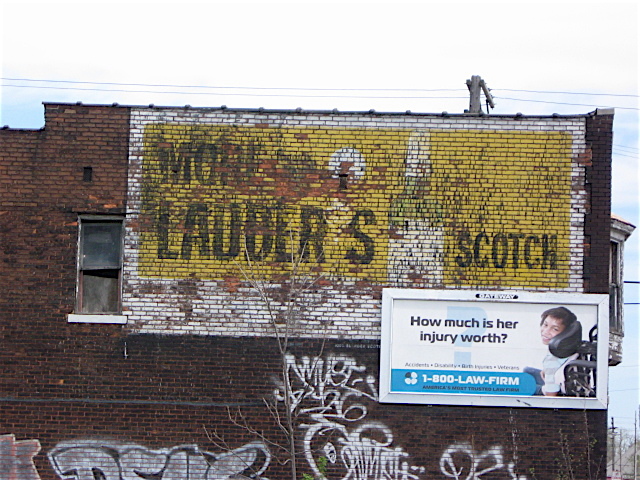 This is the third of an occasional blog entry on Detroit’s fading wall signs. To read the earlier entries, click on the headlines below. 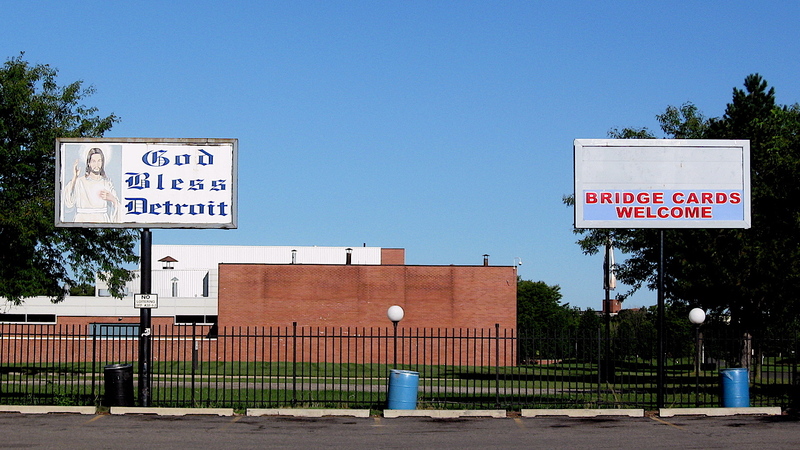 In many ways, Detroit is defined by contrast. It seems to be everywhere. There are modern, slick-looking casinos lined with colorful neon. 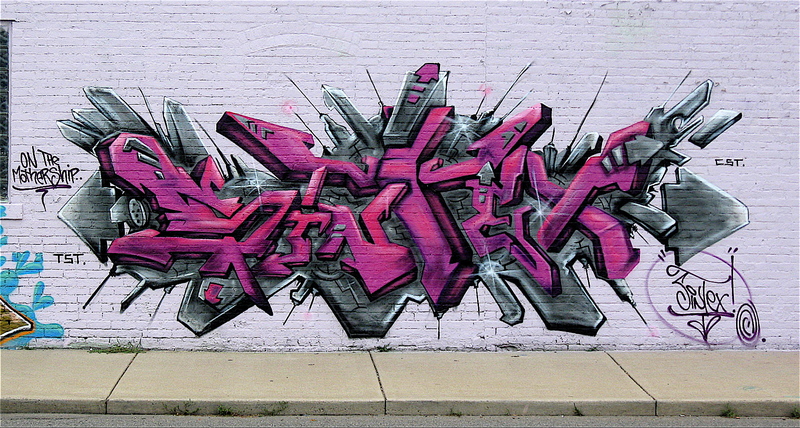 Directly across from them are abandoned buildings sprayed with gritty urban graffiti. There are poor people on beat-up bicycles, slowly riding to neighborhood party stores, while young people living in up-and-coming neighborhoods zoom by on expensive road bikes. 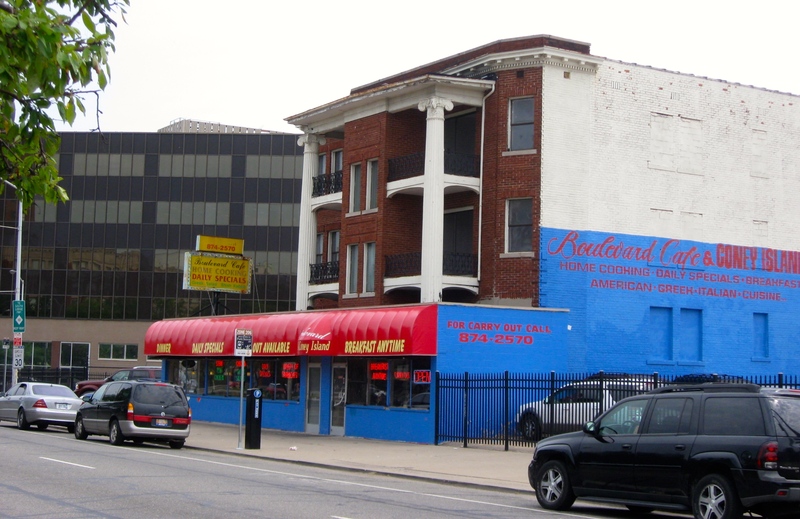 The city has an abundance of storefront churches, some located next to party stores with outside signs promoting liquor and the acceptance of state issued, food assistance bridge cards. There are also contrasts in the signs I see posted to the sides of buildings, utility poles, and elsewhere. I spotted two in particular that seem to define the harsh contrast found within this peculiar city. When I saw these signs placed side-by-side, they made me smile. They also made me think about how fragmented Detroit has become. 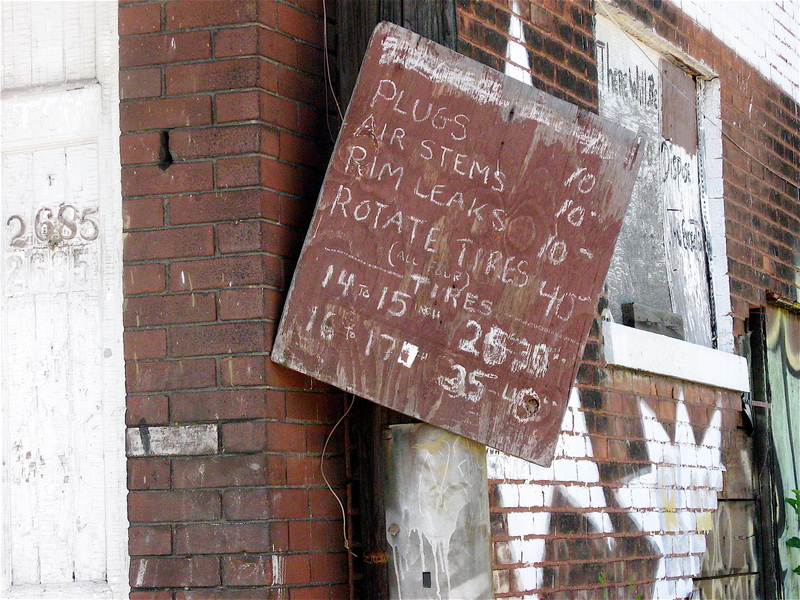 I love the juxtaposition of the two signs and had the thought that nothing defines Detroit more than the few words found on each. 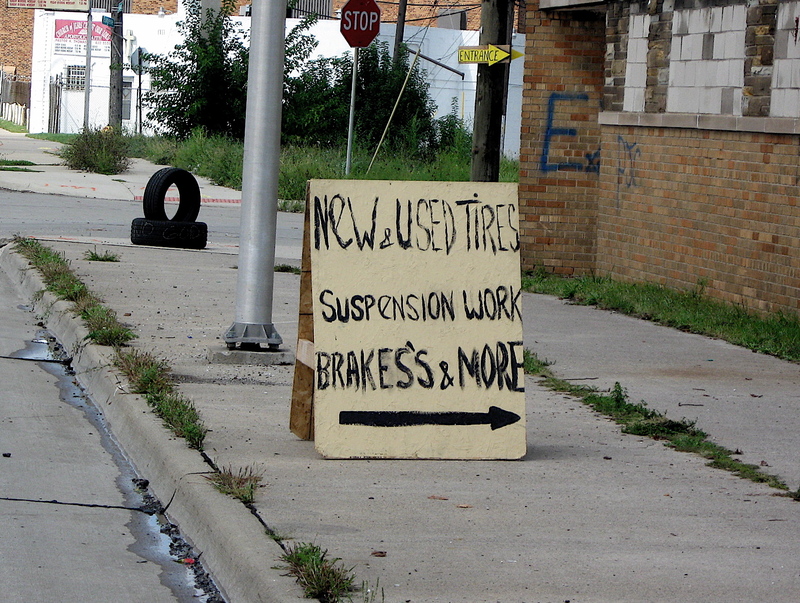 As I’ve written in the past, Detroit has an abundance of unusual, grass-root level signs. They come in a variety of formats ranging from hand-painted business names with wobbly, dripping painted letters, to well-crafted professional signs littered with typos. 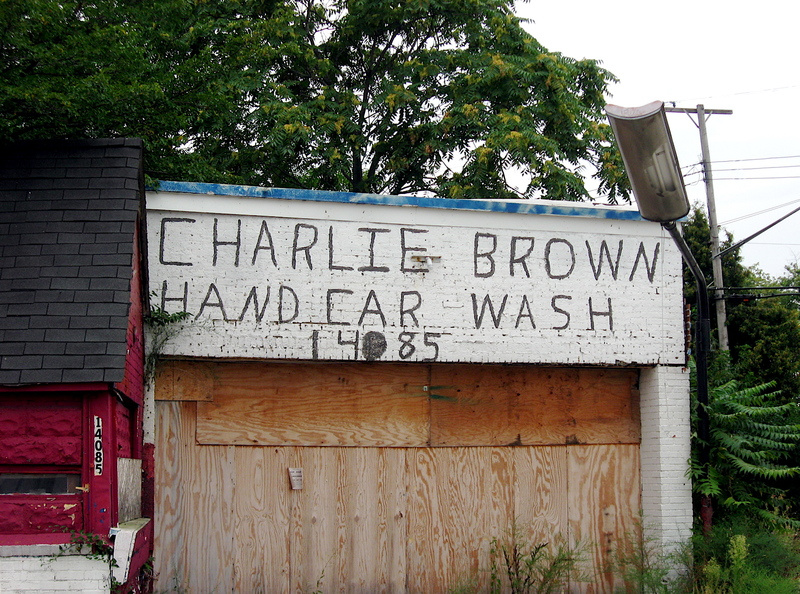 There are also plenty in the city that offer simple services such as tire repairs or washes, written with chalk or crudely spray painted on a piece of scrap plywood or other found materials..
My favorites are the modest hand-painted versions I see on my bicycle rides in the city. Many look as if they were a quick after thought to running a business. 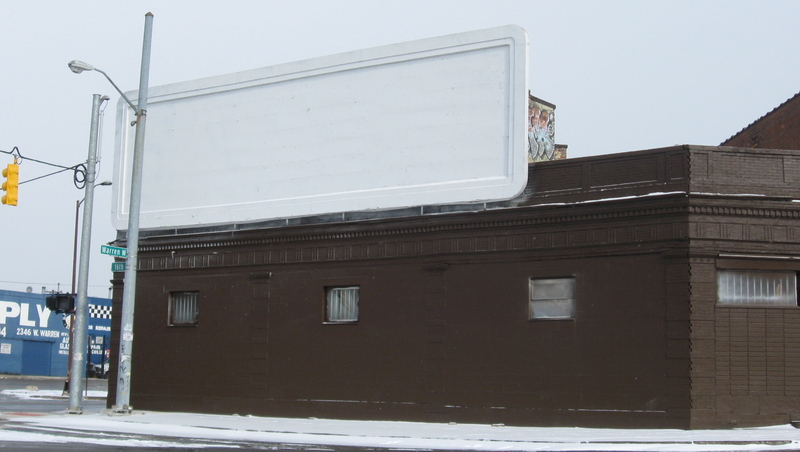 The oddly constructed signs can be seen propped up against street sign supports, nailed to telephone poles, or spray painted to the side of a run-down building that houses the business or service the signs advertise. In a bizarre way, the crudely painted signs and those with typos, can be quite appealing and add to the overall grittiness of the city scape. This entry is the fifth of an occasional blog entry on the amusing signs. To view the other’s in this series, click on the headlines below. 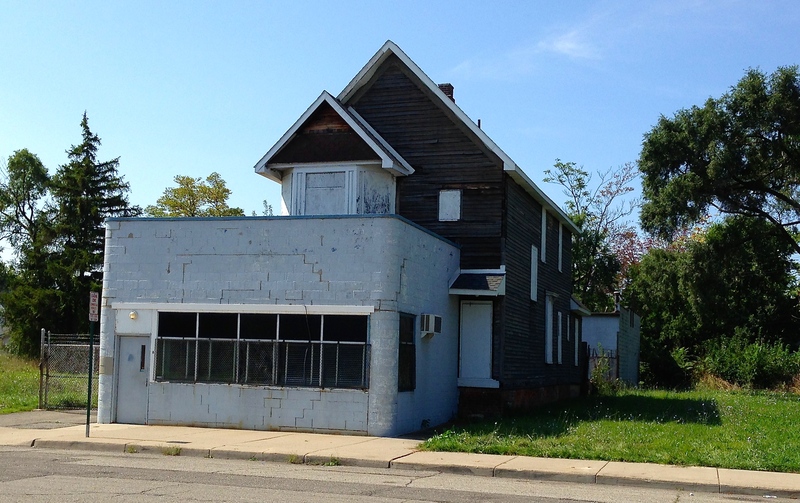 On my bicycle rides in Detroit, I see plenty of storefront churches. The places of worship vary in size. I’ve seen them setup in places with a span of about twelve feet wide and just as deep. Others are spread over a large space that at one time may have housed a grocery store, or some other good-sized business. Some are low-key and unassuming in appearance, while others shout out their presence in big bold letters on well-maintained buildings. On occasion, I spot one that truly catches my eye. 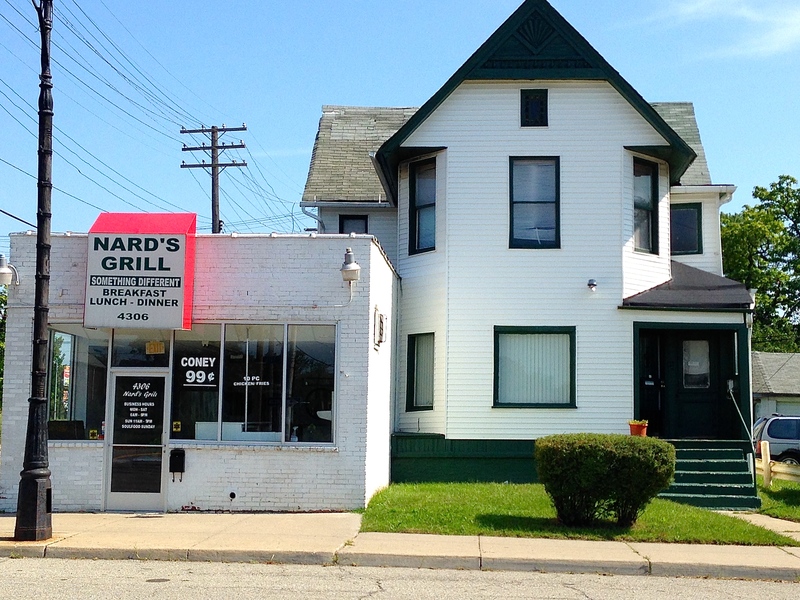 On Detroit’s northeast side is one of those peculiar places. There isn’t anything really special about the building or its design. 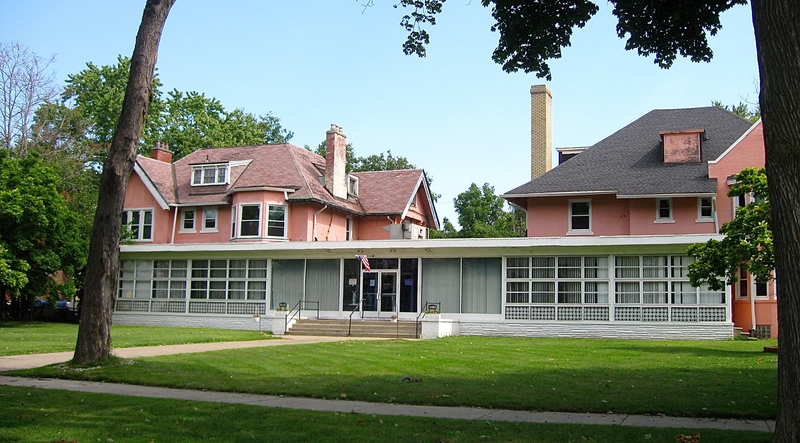 It isn’t in a vintage Art Deco place or a former neighborhood bank that was built in the Neo-classic style of architecture popular in the early 1900s. It’s just a modest, one-story wooden structure that combines five individual storefronts into one long church. To me, that’s the beauty of it. In taking a close look at the place, I noticed the overall color scheme of the building includes highlights that wrap around and above the windows, creating quasi-arches on the white background. I also noticed the windows have been converted to glass block, and they are grouped into four sets scattered across the front. Two of the four entry doors are gated, and a set of double doors on the far left look as if they haven’t been opened in years. They feature a couple of painted crosses. The paint color of the arches and window trim is remarkably close to the reddish color shingles. In the center of the long building are three rough-looking crosses. They too are trimmed in the reddish paint. The craggy crosses are housed in former window openings that have been bricked in. They are also made of glass block and are a bit rough along the edges. I like how they don’t have a lot of uniformity in their design. I also like how the painted outlines to the left of the crosses have a much heavier line than the opposite side, creating an odd balance. Looking at them reminded me of a Southern country folk art painting; a painting Howard Finster may have created years ago. 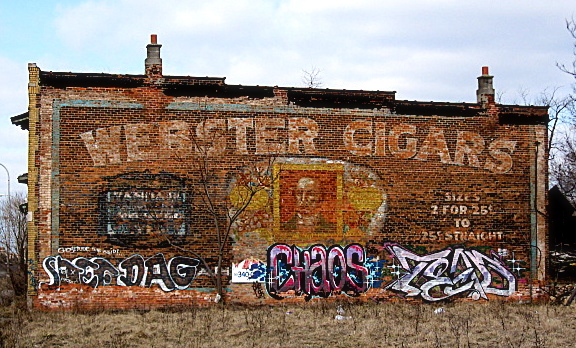 There is a building at West Warren Avenue at Grand River Avenue that at one time featured some of Detroit’s finest graffiti. Painted on the walls of that building were large, multi-colored masterpieces put up by graffiti artists Sintex, Deco 23, the TST crew, and other well-known street painters using aerosol paint cans. I’ve seen the eye-catching, engaging art on three sides of the building for well over a year, and I always stop to study the complexity of the pieces when riding my bicycle through that part of town. I was riding past that building a few weeks ago and didn’t recognize it. All the brilliant wall art found on that outside gallery had been painted over! The art pieces weren’t vandalized by others spraying a quick black and white tag over them, nor were they covered by newer, 3-dimensional appearing graffiti masterpieces. Unfortunately, they were totally gone because the building had been painted a dark brown color from top to bottom. Thinking about the intriguing graffiti that was once there and why it may have been painted over, I decided to investigate. So the other day I went by there to see what I could find out. Located right behind the building that once featured the stunning wall art is a business called Architectural Salvage Warehouse. It’s an interesting non-profit organization that sells salvaged artifacts, building materials, etc. 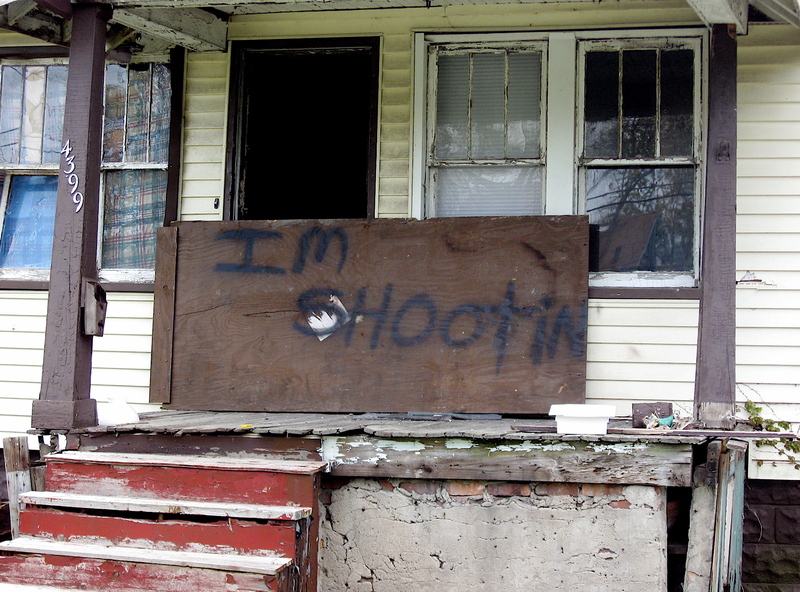 from old homes slated to be torn down in Detroit and the surrounding communities. It happened to be open, so I stopped by and asked one of the staff members what happened to the graffiti art on the building in front. 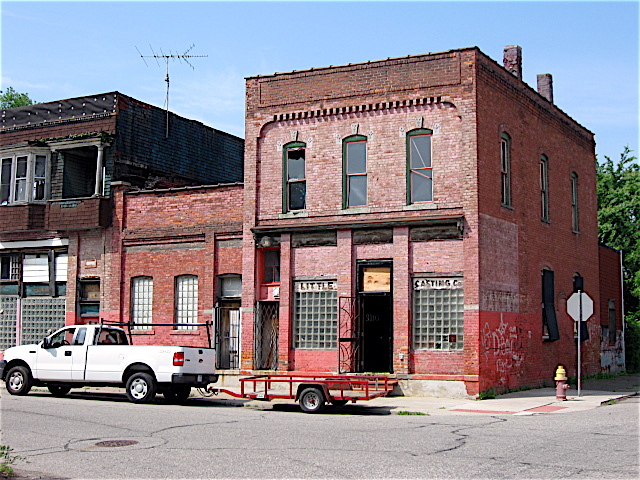 The person I spoke with at the salvage warehouse speculated that the building owner is preparing it for a possible sale. 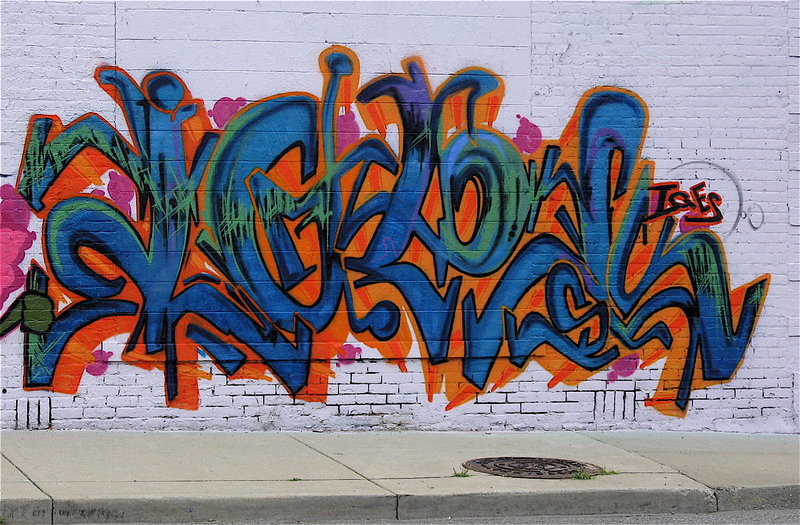 He also thought the owner might be getting sick of looking at the graffiti that once covered his place, even though he allowed the artists to use the building as a pallet for their colorful work. 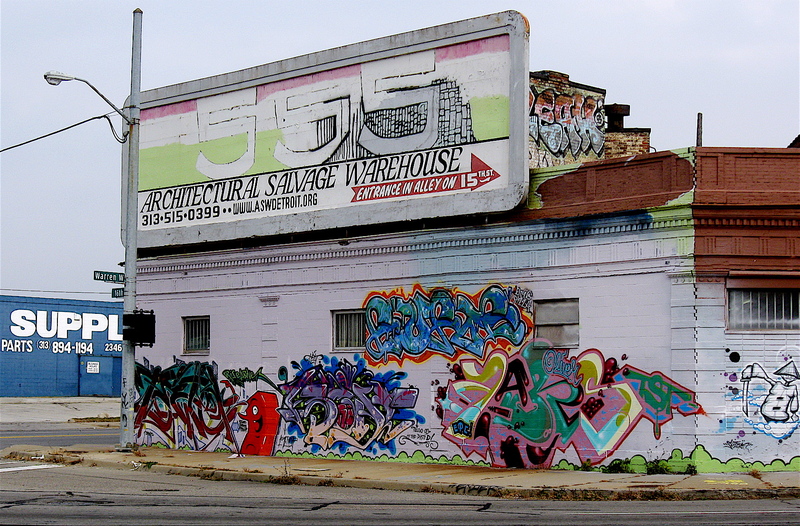 Regardless, the building that was once adorned with some of Detroit’s best graffiti art is now painted dark brown. Here are a few of the beautiful graffiti art pieces that are found under the brown paint on that building. Some I’ve posted in earlier blog entries. Any guesses on what this spells?